In the pluralized, multipolar world, in which military and economic sources of power are widely distributed and technologies are making nation states increasingly more porous, the US and its partners face significant challenges on how best to adapt and thrive in a period of revolutionary changes. These factors may change the way US analysts, planners, and operators evaluate approaches in order to affect and direct the outcomes of military operations. To date, such courses of actions to a large extend have focused on compelling adversaries through the threat or application of force to achieve victory (i.e., “control”). In this changing geopolitical/technical landscape, it is increasingly clear that the DOD needs complement “control” with an explicit focus upon “influence” factors and forces that produce desired behavioral outcomes across complex and intermeshed human and technical systems. – Today’s national and military leaders have grown up in an environment where the objective was to defeat the adversary. In today’s environment, preserving stability may be an even more important subject. Our competitors understand our desire to win, and—as in a game of chess—can use that knowledge to maneuver us into a stalemate situation. We need to set objectives that allow the United States to win in a situation that appears to be a draw. – Strategy is inherently about changing the behavior of relevant actors in support of national interests. This means information must be a primary planning consideration for the joint force rather than an enabling capability. To better link tactics to strategy, the joint force must change both its operational art and its cultural mindset to focus on behavioral outcomes. – Capabilities to inform, influence, and persuade are necessary both for national security success and as a cost-effective toolset relative to physical military power. – Influence and control are two ways to exert power over others’ decisions, where control removes an actor’s ability to choose. Influence is critical in conflicts such as those in the Gray Zone, whose limited nature leaves adversaries and allies able to choose. Influence requires planners to focus on three key aspects: (1) using more realistic accounts of human motivation; (2) focusing on areas of particular human cognitive bias as a source of low-hanging fruit for performance improvement; and finally (3) using tried and tested tools and techniques from other fields to make evidence available in usable forms for operators. – Control is dependent on actual or at least perceived power—political, economic, military, demographic, and other. Influence is the product of an even more varied and changing set of variables. The criteria that define the probability of success in exerting or countering influence must include two factors: accuracy in assessing the possible steps of an adversary and shaping persuasive communications so as to advance one’s own position and reduce the power of the opponent’s. – Neurocognitive science is providing increasingly more detailed understanding of processes of influence, decision-making, and behavioral action. Understanding these mechanisms enables greater capacity to develop techniques and tools that can be used to access, assess, and target the ways and extent that thought and emotion can elicit and/or mitigate certain types of behavior. – Combating misinformation and disinformation online will require a scientific approach grounded in empirically validated theory. It is necessarily interdisciplinary, requiring insights from decision science, computer science, the social sciences, and systems integration. – Military commanders and senior leaders must have a basic understanding of cognitive influence in order to make decisions affecting the Gray Zone and human populations in areas of ongoing military operations. Success during Gray Zone operations requires commanders to understand influence and employ models of behavioral change in the same manner that they understand the elements of patrolling and employ kinetic power. 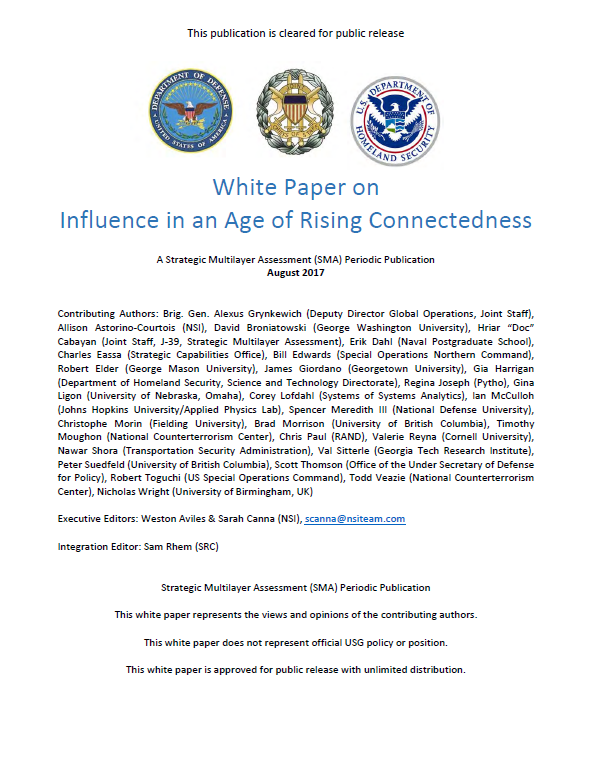 The white paper is a compilation of contributions on this topic that have been synthesized to reflect and build off the insights of one another.